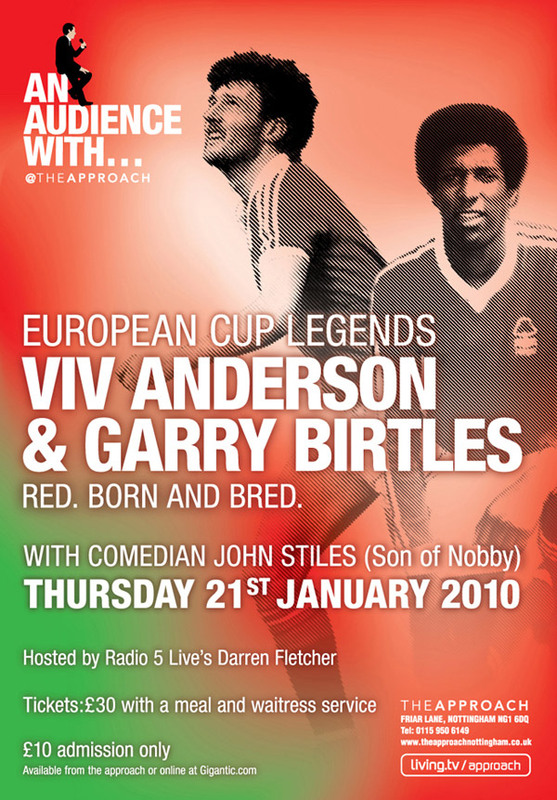 03 | January | 2010 | Through the seasons before us..
An Evening with Viv Anderson and Garry Birtles..
Here’s an opportunity to spend an evening in the company of a couple of true Reds legends – born and bred ones at that. On 21st January 2010, Viv Anderson and Garry Birtles will be at The Approach to take your questions via compere Darren Fletcher. Just £10 gets you in, or £30 if you’d like food and a waitress service too – it should prove to be a good evening’s entertainment. Whilst Garry is a familiar voice through his Evening Post column, Viv Anderson doesn’t seem to appear at such events too often – so it’s a great opportunity to hear a few stories from him too. Then of course there’s the added bonus of comedian John Stiles to boot!